KNOW THE FAITH. SHARE THE FAITH. We have the same call - that’s the New Evangelization. This new documentary series from Bishop Barron’s Word on Fire, continues the story of CATHOLICISM and explores the Church’s mission and the challenges of contemporary culture. With the original CATHOLICISM series, Bishop Barron took us on a journey around the world deep into the Faith. Now, experience this Faith in action in CATHOLICISM: The New Evangelization. 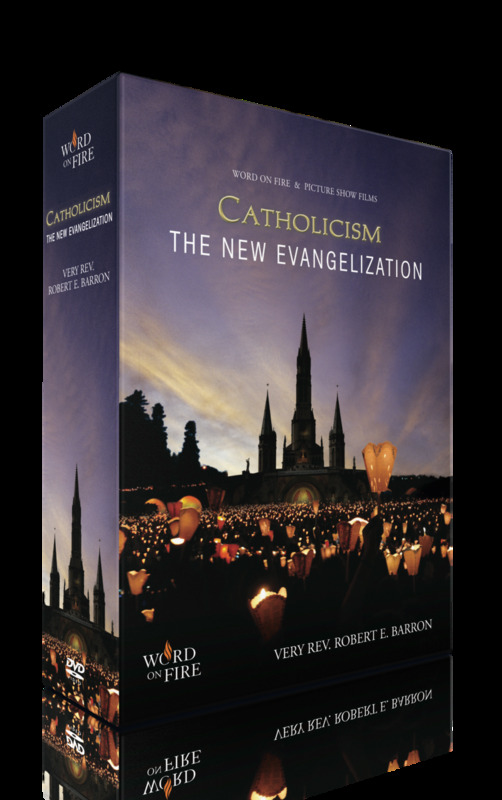 This multi-disc DVD set also includes 4 hours of extra features including two Bishop Barron speeches and full interviews and insights on the New Evangelization with George Weigel, Ross Douthat, Brad Gregory, and Brandon Vogt. Are you ready to evangelize? The Catholic Faith is not about myths or legends, symbols or literary devices. It's about an encounter so overwhelming that you want to tell the whole world. It is an encounter with Jesus Christ. Throughout history the call of Christ has sent people to the corners of the earth with a message of great joy, a message that has built civilizations, inspired cultures and even sent some to prisons and to their deaths. We have the same call today--that's the New Evangelization. This new documentary series from Fr. Robert Barron continues the story of his major Catholicism series and explores the Church's mission and the challenges of contemporary culture. With the original Catholicism series, Fr. Barron took us on a journey around the world deep into the Faith. Now, experience this Faith in action in Catholicism: The New Evangelization. This film tells us what the "New Evangelization" is and then takes us on a fascinating tour to witness examples of new ardor, new expressions and new methods of evangelization in action. This multi-disc DVD set also includes 4 hours of extra features including two Fr. Barron speeches and full interviews and insights on the New Evangelization with George Weigel, Ross Douthat, Brad Gregory, and Brandon Vogt.